Every year hundred of thousands of basements are damaged or ruined by the water and or mold even though according to insurance companies 93% of these are preventable. Fact # 1: Basements are below grade and the lowest point in the home. By the laws of gravity any water leak from appliance or the smallest crack in the foundation and water will eventually finds its way to the basement floor. Fact # 2: Basement walls are traditionally made of unreinforced masonry or concrete. As a result, foundation walls are very vulnerable to cracking through out the life of the structure. Poor grading around the home, or overflowing eaves troughs combined with a wet fall and cold winter and you have a hairline crack in the foundation wall from frost. Fact # 3: Drainage systems and sump pumps do fail. Broken or clogged drainage tile around the exterior foundation, or a failed sump pump and water will infiltrate into the basement floor usually in wet spring or wet fall season. Fact # 4: Building related sickness cost $58 Billion in United States last year. People spend 90% of their time indoors, so indoor air quality is very important. Mold often develops behind basement walls and can often goes undetected for years (usually discovered by potential buyer) Due to the stack effect in the winter when the furnace is on the air from the basement rises up through the house. 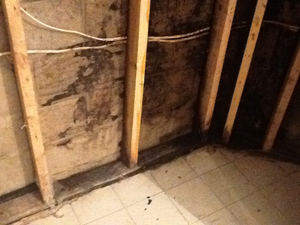 If there is mold behind the walls it will contaminate the whole house. Fact # 5: 25% of the population is sensitive to mold spores. The presence of mold in the home can have harmful effect on 25% of the population who have asthma or respiratory problems and even more severe for those that are young or old. 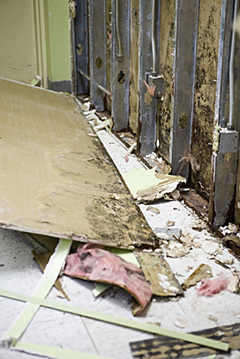 Fact #1: Damage caused by water is now Number 1 representing 40% total claims. According to insurance companies water damage is by far the largest at 40% of all claims, greater than auto, fire and theft. With changing weather patterns and increased storm intensities the number and the cost to repair claims resulting from water damage will only escalade. Fact # 1: According to CMHC over 50% of the homes have mold levels above the acceptable tolerances. Fact # 2: The average person in North America spends 90% of the time indoors. Fact # 3: According to USA Weekend there has ben a 300% increase in Asthma over the past 20 years. Fact # 4: According to the American Bar Association, there has been a 200% increase in the defect mold litigation over the past 5 years. "We didn’t waterproof the exterior of our basement, but with FLOODSILL under our partitions we feel safe"
FLOODSILL™ © 2013-2019. All rights reserved.